Even though they often go ignored, your home's gutter system is a crucial component of your home's overall safety. Water that drips down the side of your home can cause stains and soil erosion, which can lead to foundation leaks. Rather than suffer these consequences, checking in on your gutters and installing new ones if needed is the smarter option. Summit Roofing and Siding Contractors offers comprehensive gutter services including gutter installation and gutter protection. We will evaluate your current system and make the best recommendation, whether that is to install new gutters or to add gutter guards to your existing features. We also offer gutter cleaning to ensure debris isn't getting in the way of your gutters' functionality. If you're interested in new gutters for your home, give us a call today at 1-844-385-9661 or click below to get started! We offer free estimates on all our gutter services in Chalfont, Lansdale, Doylestown and the surrounding areas. When you work with a professional gutter company like Summit Roofing and Siding Contractors, your technician will walk you through each of these points to ensure you're receiving the best gutters for your home. No matter what options you choose, we'll work with you to ensure your gutters will protect your home and look great while doing so. 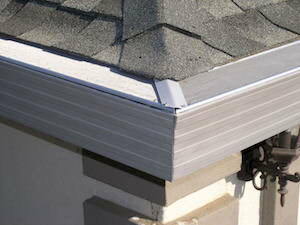 We'll help you get gutter guards that eliminate gutter clogs and debris. Gutterglove Pro is a high-quality, aluminum guard with stainless steel mesh that will keep debris out of your gutter system forever. It consists of two components; a perforated aluminum channel and type 316 stainless steel mesh. The stainless steel mesh is glued into grooves along both sides of each 5 foot aluminum channel section. It installs on any existing gutter. Gutterglove’s specifications were designed so that it simply slips under the roof shingles and fits snuggly to the front lip of your gutter. Couldn’t ask for a better contractor. Responded promptly to initial inquiry, provided a very reasonable estimate and performed the work to my schedule both efficiently and professionally. Just outstanding! If you're interested in gutter replacement or gutter installation for your home, the experts at Summit Roofing and Siding Contractors are here to help. Our experienced professionals will help you determine the right gutter services and materials for your needs and provide you with a quality repair or installation. Call us today at 1-844-385-9661 or contact us online to get started on your gutter project. We offer free estimates on all our work in Chalfont, Lansdale, Doylestown and throughout the surrounding areas. Summit Roofing and Siding Contractors is an independent contractor and is not an affiliate of Owens Corning Roofing and Asphalt, LLC or its affiliated companies. THE PINK PANTHER™ & © 1964-2019 Metro-Goldwyn-Mayer Studios Inc. All Rights Reserved.